Robbie started drumming at the age of 11 and by 17 was playing professionally. His tremendous versatility has allowed him to be involved with every imaginable venue and style of music. In the early 80's he played professionally in the pit Orchestra for Edison valley Playhouse. This was followed by a series of original and cover rock bands throughout the next 15 years, including Locnar and Resin and The Branded Roads Band, which was a Southern Rock/Lynard Skynard tribute band opening for such greats as The Outlaws, The Marshall Tucker Band and Blackfoot to name just a few. 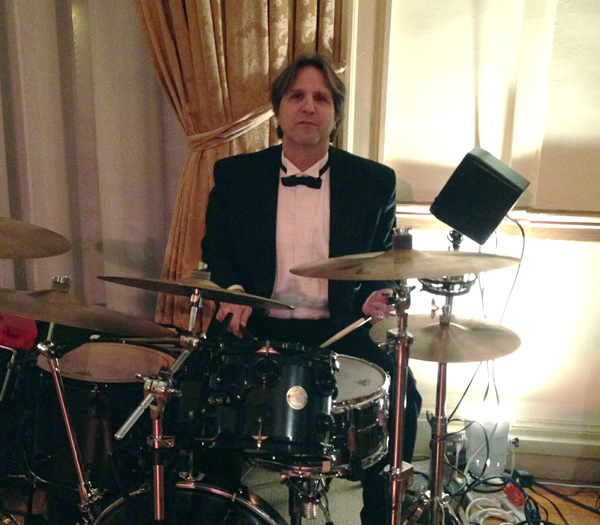 For the Past 17 years Robbie has also honed his versatility playing with a German Dance Band called Bernie's Orchestra, which is one of the best ethnic bands in the tri-state area. They have played for The United nations at The Met-Life Building NY City, PNC Arts Center to being a regular at The Tavern On The Green, Central Park, NY City. They also Played out as far as Chicago IL to play some Great Ocktober Festsivals. Robbie has also been busy playing with The Expressway Band a 5-piece cover band playing rock and soul music in some of Central Jersey's most upscale clubs and restaurants. Two of Expressway's current members formed this band after having been with the original "Atlantic City Expressway Band", with other members Jon Bon Jovi and David Bryan (currently of Bon Jovi) and Al Chez (Trumpet player for the David Letterman Orchestra). "Robbie, You Rocked The Pony!" and US Route 22 in Kenilworth, Union County, NJ! NJ Turnpike South to Exit 14. Follow signs to ROUTE 22 WEST. Take Route 22 West to the Garden State Parkway South to Exit 138. At end of exit ramp at light, make LEFT onto Kenilworth Blvd. After 4 (FOUR) traffic lights, make RIGHT onto North 14th St. Go through 1 traffic light, make LEFT onto Lafayette Ave. At end, make LEFT onto Lafayette Place. We are in the 2nd building on the right, on the cul-de-sac. NJ Turnpike North to Exit 11 (Garden State Parkway). Garden State Parkway North to Exit 138 (Kenilworth / Roselle Park). At end of exit ramp at light, make LEFT onto Kenilworth Blvd. After 5 (FIVE) traffic lights, make RIGHT onto North 14th St. Go through 1 traffic light (2 blocks), make LEFT onto Lafayette Ave. At end, make LEFT onto Lafayette Place. We are in the 2nd building on the right, on the cul-de-sac. Route 22 East to Union County / Union, NJ. Look for the Home Depot and Wal-Mart signs, then watch for Springfield Rd on the right. Make RIGHT onto Springfield Ave, continue for 3/4 mile. Make RIGHT at Lafayette Ave. At end, make LEFT onto Lafayette Place. We are in the 2nd building on the right, on the cul-de-sac. Take Route 22 West to Union County / Union, NJ. Stay in Left lane to make U-Turn at The International House of Pancakes in center isle. Get onto Route 22 East To Springfield Ave. Make RIGHT onto Springfield Ave, continue for 3/4 mile. Make RIGHT at Lafayette Ave. At end, make LEFT onto Lafayette Place. We are in the 2nd building on the right, on the cul-de-sac.